Samujana Retreats & Residences Scoop the ‘Best Residential Architectural Design’ and ‘Best Residential Development (Samui)’ Accolades in the Esteemed Thailand Property Awards 2013. The luxurious Samui villa estate won the coveted awards at the Thailand Property Awards 2013. Announcements were made to successful applicants, and to an audience of nearly 500 guests from the Kingdom’s real estate industry at a gala dinner on Thursday 19 September, held at the Centara Grand Hotel, Bangkok. As well as offering villas for sale, Samujana operates as a pool villa retreat, offering an alternative to a traditional hotel stay. Some villas feature private cinemas, professional gyms, bars, games rooms and all villas provide villa hosts, large infinity edge pools and absolute sea views. The principal designer of Samujana, Gary Fell of Gfab Architects says, “I am delighted that Samujana has been chosen to receive an award for its architecture from our industry peers.” He continues, “The project has been a constant feature of my office over the past few years and to the best of our knowledge, we can think of no other development in the region that offers individually designed residences at this scale”. With 33 award categories, over 1000 nominations and 300 entries, this year’s awards were more competitive than previous years. Overall there were 7 Koh Samui developers that won an award showing that Koh Samui is continuing to rise up in the luxury travel and property sectors in Thailand, rivaling its big sister resort island Phuket and Indonesian competitor Bali. 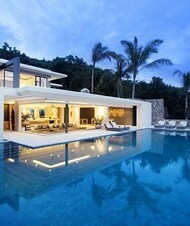 For more information on Samujana Retreats & Residences please visit www.samujana.com. Developed and managed by Samujana Company Ltd and designed by Gary Fell, the Samujana estate is a collection of 27 oversized and opulent villas, for sale and rent. All villas feature large infinity edge pools and unobstructed sea views. Perfectly perched on a hillside overlooking a coral cove; the villas offer three to eight bedrooms and are ideal for families, friends, couples and also offer ample space for upscale events and weddings. Samujana provides dedicated villa hosts, private cinemas, gyms, spa services, fitness retreats, tennis and badminton courts, beach access and all the hospitality of an upscale resort. Samujana is ideally located just minutes from Koh Samui International Airport and lively Chaweng Beach.